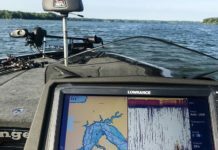 Sometimes it’s so easy to get lost in transducers, transom mounts, flashers, echoes, and sonar, that we forget what the most important decision is when it comes to choosing a fish finder: WILL THIS HELP ME CATCH THE MOST FISH! That’s why we have put together this guide to help you make the best decision possible when it comes to fish finders! This guide is aimed more at a technical level. 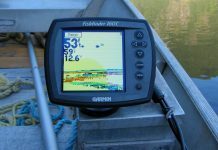 You can also find out which fish finder is best for the money. 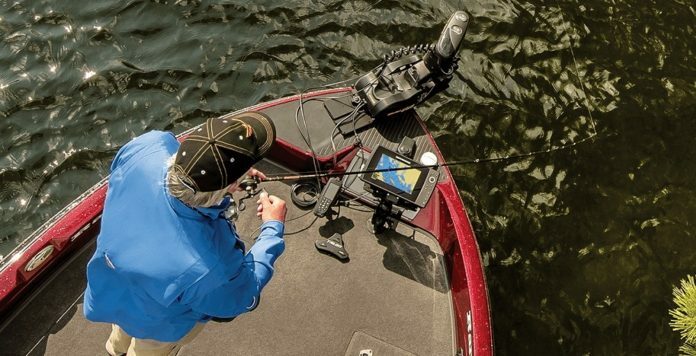 Fish finders have 8 main features you want to look for when buying. Many dual frequency transducers will come with both 20 and 60 degree cones.Frequencies also are a big factor in transducers. Most transducers will come with either 50, 83, 192 or 200 kHz frequencies, all in direct relation to the cone angle. Remember – the higher the frequency, the more detail shows up on your screen – this is because there are that many more sonar waves being sent out and received by the transducer, so if you generally fish shallow waters, this is the way to go. Some fish finders are even capable of a whopping 400+ kHz and multiple frequencies- which will show incredibly detailed images and allow you to switch between them for broader, more general views, and narrower, more detailed views. A reading at 50kHz. Notice how the water bed is fuzzy. The same area at 200kHz – notice how much sharper the bottom is – you can even make out some objects on the water bed that seem like plants or small fish. Power is a very crucial factor to consider before you make your purchase. At Fish Finder Source, we’ve sorted our fish finders by nearly every specification so you can find your ideal fit very easily. Power of fish finder units is measured in wattage(W). The greater the wattage, the faster your unit can display readings, and the deeper your readings can be. The lesser the wattage, the slower it will be, and suited to shallower water. This is because your fish finder translates the sonar waves it receives from the transducer. If the overall power is less, the sonar waves will be slower, and ultimately, your reading will be fuzzier. If the overall power is greater, the waves will be much faster and your reading that much clearer. On a final note, the shallower the water you fish in, the less power you will need. 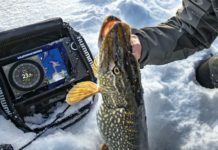 If you plan on fishing in deep water like the Great Lakes or salt water bodies, it’s best that you go for the most powerful(in terms of wattage) fish finder that your budget can fit. Remember: at 50 kHz, for every 100 watts of power, your finder/transducer can show readings up to 400 feet. At 200 kHz, for every 100 watts of power, your finder/transducer can show readings up to 100 feet. Most mid-range finders available are dual-frequency, so you can see readings from both frequencies(usually 50/200 or 85/200) in a split screen fashion. 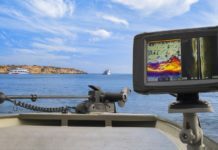 The amount of pixels your fish finder’s screen displays is also an important factor to consider. Think of a pixel as a single dot on your screen. This dot is the smallest amount of detail your screen can show you. All of these dots put together are what you ultimately see. Suppose your screen was 640 x 640 pixels: this means that there are 640 dots in each row going right to left, and 640 dots going in each column up to down. The greater number of pixels there are, the more detail you can see. At minimum, you want a screen of 240(v) x 160(h) pixels. Even then, the image will be pretty blocky. For sharper, crisper images, it’s worth investing in a higher-resolution screen. Screen resolution, put together with screen size will be the ultimate factor for how clear your display is. The less expensive units will usually have smaller screens, which make them good choices for backup or secondary fish finders. If you are looking to buy your main unit, you should go for the biggest size your budget will allow. This will give you a clearer picture, since the echoes, data, and numbers will be spread out and easier to see and differentiate. Color screens are the new standard in electronics. They allow for greater detail, showing up to millions of colors compared to just 265 shades of gray! 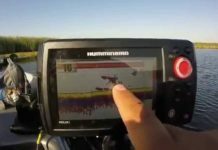 A color fish finder will make fish and underwater objects truly pop out at you from the screen. This makes it much simpler for you to see what’s going on. Color screens are easier to see in bright light than black and white screens, and if the weather is dark or cloudy, the screens will be outstanding! Black and white models are still available, but unless that is the only feature set that fits in your budget at the time, you would get much more enjoyment from a color screen. If not, then, something is better than nothing, and a black and white screen is a good place to start. Transducers are the main units that emit and receive sonar waves. The transducers send the sonar signal into the water, and they bounce off of objects underwater and are picked up again by the transducer. It sends the data it picked up to the main unit, which translates the signal into a picture that we can see and understand. Most of the fish finder units we carry come with transom mount transducers out of the box. These are easiest to mount and require very little installation. As your needs(or boat) get more and more advanced, it’s better to go for other types of transducers such as thru-hull. An important aspect in choosing a transducer is cone angle. Cone angle refers to how wide of a beam is sent from the bottom of your boat into the water. This of it as an upside-down ice cream cone. At the top, it is very thin and pointy(this is where your transducer is). As it goes down further and further, it gets wider and wider. The wider the degree of the cone, the larger the area is that is being covered. As you go deeper and deeper, the cone gets wider and wider. It’s important to remember though that as the cone angle gets wider, the sensitivity starts to diminish in deeper water. Transducer cones are available in ranges of 9-degrees to greater than 60-degrees. Most units are usually between 16 and 20-degrees. A 20-degree cone is an excellent point to start at for anglers that fish in different water depths. A really cool feature of transducers is that they have more than one cone transmitting from the same starting point. In other words, the standard transducer will have a single beam. As you get more and more advanced, you can progress to a dual beam, triple beam, side beam and so forth. Each additional beam helps you cover more and more water – which is a great option to have when you are looking around in a lake for fish. Some models come standard with these accessories, while others will require an upgrade. Cost will come into effect for these pricier, but significant advantages. Dual beams are far superior to single beams if your main playing area is relatively shallow water, as they will cover more of the water effectively. Even though, transducers come in different materials, each of which is suited to a particular type of boat, most of the fish finder units we stock come with plastic transom mount transducers out of the box. This is perfectly fine for most casual/sport fishing, and is compatible with mostly all kinds of boats, except perhaps pontoons, in which you would have to creatively mount the transducer somewhere else. When using an in-hull or thru-hull transducer, plastic housings are recommended for fiberglass or metal hulls. Stainless Steel housings are recommended for steel or aluminum hulls. Bronze housings are recommended for fiberglass or wood hulls. Most fish finders geared towards recreational anglers come with transom mount transducers or trolling motor transducers which will work well with any type of boat. Just remember to install them properly! If you want to go for a through-hull transducer, you have a choice between bronze and plastic. For wooden hulls, it’s better to use bronze rather than plastic because the expansion of wood could do damage to a plastic transducer, and end up causing a leak. Installation of a stainless steel housing in a metal hull requires an insulating fairing. If your boat has a positive ground system, you SHOULD NOT install a transducer with metal housing. Some units have extra features such as a speed and distance feature. This is particularly important in trolling, as you can tell the speed you were travelling when a fish strikes. The same goes for drift fishermen, when the fish species you are after is choosy about what speed they will chase a bait on. Having a temperature gauge on board is also very important. 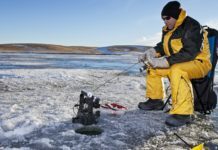 This will help you find warmer water, or locating an ideal temperature for what fish you are trying to catch.